The Battle of Vittorio Veneto was fought from 24 October to 3 November 1918 (with an armistice taking effect 24 hours later) near Vittorio Veneto on the Italian Front during World War I. The Italian victory marked the end of the war on the Italian Front, secured the dissolution of the Austro-Hungarian Empire and contributed to the end of the First World War just one week later. The battle led to the capture of 5,000+ artillery pieces and over 350,000 Austro-Hungarian troops, including 120,000 Germans, 83,000 Czechs and Slovaks, 60,000 South Slavs, 40,000 Poles, several tens of thousands of Romanians and Ukrainians, and 7,000 Italians and Friulians. Some Italian authors see Vittorio Veneto as the final culmination of the Risorgimento nationalist movement, in which Italy was unified. When the battle was fought in November 1918, the nearby city was called simply Vittorio, named in 1866 for Vittorio Emanuele II, monarch from 1861 of the newly created Kingdom of Italy. The engagement, the last major battle in the war (1915–1918) between Italy and Austro-Hungary, was generally referred to as the Battle of Vittorio Veneto, i.e. 'Vittorio in the Veneto region'. The city's name was officially changed to Vittorio Veneto in July 1923. During the Battle of Caporetto, from 24 October to 9 November 1917, the Italian Army had over 300,000 casualties (dead, injured and captured) and was forced to withdraw, causing the replacement of the Italian Supreme Commander Luigi Cadorna with General Armando Diaz. Diaz reorganized the troops, blocked the enemy advance by implementing defense in depth and mobile reserves, and stabilized the front-line around the Piave River. In June 1918, a large Austro-Hungarian offensive, aimed at breaking the Piave River defensive line and delivering a decisive blow to the Italian Army, was launched. The Austro-Hungarian Army tried on one side to force the Tonale Pass and enter Lombardy, and on the other side to make two converging thrusts into central Venetia, the first one southeastward from the Trentino, and the second one southwestward across the lower Piave. The whole offensive, which became known as the Battle of the Piave River ended in a heavy defeat for the imperial army, with the Austro-Hungarians losing 11,643 killed, 80,852 wounded and 25,547 captured. After the Battle of the Piave, General Armando Diaz, despite aggressive appeals by Allied commanders, deliberately abstained from offensive action until Italy would be ready to strike with success assured. 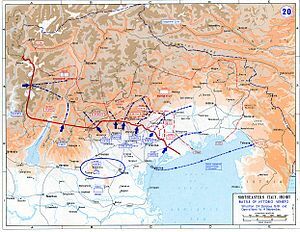 In the offensive he planned, three of the five armies lining the front from the Monte Grappa sector to the Adriatic end of the Piave were to drive across the river toward Vittorio Veneto, so as to cut communications between the two Austrian armies opposing them. Allied forces totaled 57 infantry divisions, including 52 Italian, 3 British (23rd, 7th and 48th), 2 French (23rd and 24th), and the 332nd US Infantry Regiment, along with supporting arms. The Austro-Hungarian army had 46 infantry divisions and 6 cavalry divisions, but both sides were ravaged by influenza and malaria and the Austrians only had 6,030 guns to 7,700 Allied. The Italian armies in the mountains were merely to hold the front line and follow up the enemy when he retreated. The task of opening the attack and taking on the strongest positions fell to Fourth Army (Lieutenant-General Gaetano Giardino) on the Grappa. Twelfth Army, consisting of one French and three Italian divisions was commanded by the English-speaking Lieutenant-General Enrico Caviglia and he had under command Tenth Army (Lieutenant-General Lord Cavan) to protect his right flank. Lord Cavan's army consisted of two British and two Italian divisions and they too were expected to cross the Piave by breaking the Austrian defenses at Papadopoli Island. The Third Army was simply to hold the lower Piave and cross the river when enemy resistance was broken. The Ninth Army, which contained two Italian divisions as well as the 6th Czechoslovak Division (consisting of former POW's captured by the Italians) and the 332nd US Infantry Regiment, was held in reserve. The Allies had 600 aircraft (93 Anglo-French, including 4 RAF squadrons) to gain complete air superiority in the final offensive. 7th Italian Army (Giulio Cesare Tassoni): between the Stelvio and the western shore of Lake Garda. 1st Italian Army (Guglielmo Pecori Giraldi): from the west bank of the Lake Garda to the Val d'Astico. 6th Italian Army (Luca Montuori): from the plateau of Asiago to the left bank of the Brenta. 4th Italian Army (Gaetano Giardino): Monte Grappa to Cima Palon. 12th Franco-Italian Army (French General Jean César Graziani): from Monte Tomba up to the bridges of Vidor on the Piave. 8th Italian Army (Enrico Caviglia): along the Piave, from Vidor to Priula Bridge. The assault corps of General Francesco Saverio Grazioli. 10th British-Italian Army (Earl of Cavan) along the Piave from Ponte Priula to Ponte di Piave. 14th British Corps of General James Melville Babington. 3rd Italian Army (Duke of Aosta): from Ponte di Piave to the sea. 9th Italian Army (Paolo Morrone) : in reserve. As night fell on 23 October, leading elements of Lord Cavan's Tenth Army were to force a crossing at a point where there were a number of islands, and Cavan had decided to seize the largest of these — the Grave di Papadopoli — as a preparation for the full-scale assault on the far bank. The plan was for two battalions from 22nd Brigade of the British 7th Division to occupy the northern half of Papadopoli while the Italian 11th Corps took the southern half. The British troops detailed for the night attack were the 2/1 Honourable Artillery Company (an infantry battalion despite the title) and the 1/ Royal Welch Fusiliers. These troops were helpless to negotiate such a torrent as the Piave, and relied upon boats propelled by the 18th Pontieri under the command of Captain Odini of the Italian engineers. On the misty night of the 23rd the Italians rowed the British forces across with a calm assurance and skill which amazed many of those who were more frightened of drowning than of fighting the Austrians. For the sake of silence the HAC used only their bayonets until the alarm was raised, and soon seized their half of the island. The Italian assault on the south of Papadopoli was driven off by heavy machine-gun fire. Nevertheless, the Austrians had surrendered the island by the end of the night. On 24 October, the anniversary of the Battle of Caporetto, in the early hours Comando Supremo launched the splintering attack on Monte Grappa designed to draw in the Austro-Hungarian reserves. At 03:00 the right wing of the Italian Fourth Army began a barrage to give time for its men to move into position. At 05:00 the rest of the artillery joined in. The infantry began to struggle up the steep slopes and secondary peaks which the Austrians had held for so long. The flooding of the Piave prevented two of the three central armies from advancing simultaneously with the third; but the latter, under the command of Earl Cavan, after seizing Papadopoli Island farther downstream, won a foothold on the left bank of the river on 27 October. In the evening the Allies had covered so much ground that they were over-extended and vulnerable to a counter-attack. The Italian Tenth Army maintained its ground and had established a bridgehead 2.5 miles (4.0 km) deep and 5 miles (8.0 km) broad. The British captured 3,520 prisoners and 54 guns. Svetozar Boroević von Bojna, the Austro-Hungarian commander, ordered a counter-attack on the Italian bridgeheads on the same day, but his troops refused to obey orders, a problem confronting the Austrians from that time on, and the counter-attack failed. The first days of the battle involved heavy artillery dueling between the two sides, which were fairly evenly matched in firepower with the Italians possessing 7,700 guns to the Austro-Hungarians' 6,000 guns. From 24 October to 31 October alone, the Italian artillery fired 2,446,000 shells. On 28 October, a group of Czechs declared Bohemia's independence from Austria-Hungary. The next day, another group purporting to represent the eventual South Slavs proclaimed their independence, and on 31 October, the Hungarian Parliament proclaimed their withdrawal from the union, officially dissolving the Austro-Hungarian state. On 28 October, under these new political and military conditions, the Austro-Hungarian high command ordered a general retreat. On 29 October the Italian Eighth Army pushed on towards Vittorio Veneto, which its advance guard of lancers and Bersaglieri cyclists entered on the morning of the 30th. The Italian Third Army forced a crossing of the Lower Piave while raids in the mountains disclosed that the Austrians were withdrawing there. Reserves including the 332nd US Infantry Regiment poured over the Piave behind the Italian Tenth Army. Vittorio Veneto was seized the next day by the Italian Eighth Army, which was already pushing on to the Tagliamento river. Trieste was taken by an amphibious expedition on 3 November. The Italian Eighth Army troops which had managed to cross the Piave were only able to communicate with the west bank by using swimmers. The swimmers were furnished by one of the most elite assault units in Italian history — the Arditi Corps, the Caimani del Piave ("Caimans of the Piave"). 82 were recruited by Captain Remo Pontecorvo Bacci after Caporetto. Carrying a resolza knife and two hand grenades, they were trained to remain in the powerful currents of the icy Piave for up to 16 hours; 50 died in the river during the campaign. The Italian Twelfth Army, commanded by French General Jean Graziani, continued to advance, supported on the right by the Eighth Army. At dawn on the 31st, the Italian Fourth Army resumed the offensive on Monte Grappa and this time was able to advance beyond the old Austrian positions towards Feltre. In the mountains and on the plain the Allied armies pushed on until an armistice was arranged. The result was that Austria-Hungary lost about 30,000 killed and wounded and 300,000 prisoners (50,000 by 31 October; 100,000 by 1 November; 300,000 by 4 November). The Italians suffered during the 10 days' struggle 37,461 casualties (dead and wounded) — 24,507 of them on Monte Grappa. British casualties were 2,139, while the French lost 778 men. The Armistice of Villa Giusti was signed on 3 November at 15:20, to become effective 24 hours later, at 15:00 on 4 November. The Austrian command ordered its troops to cease hostilities on 3 November. Following the signing of the armistice, Austrian General Weber informed his Italian counterparts that the Imperial army had already laid down its weapons, and asked to cease combat immediately and to stop any further Italian advance. The proposal was sharply rejected by the Italian General Badoglio, who threatened to stop all negotiations and to continue the war. General Weber repeated the request. Even before the order to cease hostilities, the Imperial Army had already started to collapse, beginning a chaotic retreat. Italian troops continued their advance until 3 p.m. on 4 November. The occupation of all Tyrol, including Innsbruck, was completed in the following days. Under the terms of the Austrian-Italian Armistice of Villa Giusti, Austria-Hungary’s forces were required to evacuate not only all territory occupied since August 1914 but also South Tirol, Tarvisio, the Isonzo Valley, Gorizia, Trieste, Istria, western Carniola, and Dalmatia. All German forces should be expelled from Austria-Hungary within 15 days or interned, and the Allies were to have free use of Austria-Hungary’s internal communications. They were also obliged to allow the transit of the Entente armies, to reach Germany from the South. Beginning in November 1918, the Italian Army with 20,000-22,000 soldiers occupied Innsbruck and all North Tyrol. The battle marked the end of the First World War on the Italian front and secured the end of the Austro-Hungarian empire. As mentioned above, on 31 October Hungary officially left the personal union with Austria. Other parts of the empire had declared independence, notably what later became Yugoslavia. The surrender of their primary ally was another major factor in the German Empire's decision that they could no longer continue the war. On 30 October the Wilhelmshaven mutiny erupted, shortly afterwards the German Revolution of 1918–1919 started to spread from Kiel. Less than a week after the Austro-Hungarians, the Germans requested an armistice. ^ a b Burgwyn, H. James (1997). Italian foreign policy in the interwar period, 1918–1940. Greenwood Publishing Group. p. 4. ISBN 0-275-94877-3. ^ a b c d Pasoletti, Ciro (2008). A Military History of Italy. Greenwood Publishing Group. p. 150. ISBN 0-275-98505-9. ... Ludendorff wrote: In Vittorio Veneto, Austria did not lose a battle, but lose the war and itself, dragging Germany in its fall. Without the destructive battle of Vittorio Veneto, we would have been able, in a military union with the Austro-Hungarian monarchy, to continue the desperate resistance through the whole winter, in order to obtain a less harsh peace, because the Allies were very fatigued. ^ a b Marshall Cavendish Corporation (2002). History of World War I. Marshall Cavendish. pp. 715–716. ISBN 0-7614-7234-7. The Battle of Vittorio Veneto during October and November saw the Austro-Hungarian forces collapse in disarray. Thereafter the empire fell apart rapidly. ^ a b Stevenson, David (19 September 2011). With Our Backs to the Wall: Victory and Defeat in 1918. Harvard University Press. p. 157. ISBN 978-0-674-06226-9. Retrieved 26 July 2015. According to the Commando supremo the Allies had 57 divisions and 7,700 guns. ^ Duffy, Michael (1 February 2002). "The Battle of Vittorio Veneto, 1918". FirstWorldWar.com. Archived from the original on 13 May 2008. Retrieved 10 June 2008. ^ Statistics of the Military Effort of the British Empire During the Great War 1914–1920, The War Office, p. 356-357. ^ Schindler, John R. (2001). Isonzo: The Forgotten Sacrifice of the Great War. Greenwood Publishing Group. p. 303. ISBN 0-275-97204-6. ^ Mack Smith, Denis (1982). Mussolini. Knopf. p. 31. ISBN 0-394-50694-4. ^ Thompson, Mark. "The White War: Life and Death on the Italian Front 1915-1919." Basic Books, 17 March 2009. Page 363. ^ Arnaldi, Girolamo (2005). Italy and Its Invaders. Harvard University Press. p. 194. ISBN 0-674-01870-2. ^ "Historical Maps of Italy: Italy, 1920 (London Geographical Institute)". Edmaps.com. Retrieved 4 December 2017. Vittorio is shown due north of Venice, south of Belluno. ^ Ceva, Giulio (2005). Teatri di guerra. Comandi, soldati e scrittori nei conflitti europei (in Italian). Franco Angeli Editore. p. 142. ISBN 8846466802. ^ Caporetto is the Italian name of the town of Kobarid, today in Slovenia. ^ a b c Clodfelter 2017, p. 419. ^ a b c Duffy, Michael (2013). "The Battle of Vittorio Veneto, 1918". First World War.com. Retrieved 26 July 2015. ^ Seton-Watson, Christopher (1967). Italy from Liberalism to Fascism, 1870–1925. Taylor & Francis. p. 500. ISBN 0-416-18940-7. Foch urged Diaz to exploit the success. Diaz, knowing his troops were weary and short of munitions, confined himself to local operations. ^ Pieropan, Gianni (2009). Storia della Grande Guerra sul fronte italiano. 1914-1918 (in Italian). Milano: Mursia. pp. 771–773. ISBN 88-425-2830-7. ^ "L'Esercito Italiano nel 1918" (in Italian). xoomer.virgilio.it/ramius. Retrieved 3 January 2019. ^ Jewison, Glenn; Steiner, Jörg C. (2015). "Austro-Hungarian Army Higher Commands 1914-1918". Austro-Hungarian Land Forces 1848-1918. Retrieved 26 July 2015. ^ War Monthly (Issue 31): Vittorio Veneto, p. 35 by Peter Banyard. ^ a b Cervone, Pier Paolo (1994). Vittorio Veneto, l'ultima battaglia (in Italian). Milano: Mursia (Gruppo Editoriale). ISBN 88-425-1775-5. ^ Stato Maggiore dell'Esercito (1988). L'esercito italiano nella Grande Guerra (Tomo 1, 2 & 2bis) (in Italian). 5. Roma: Ufficio Storico. ^ Weber, Fritz (1959). Das Ende der alten Armee; Österreich-Ungarns Zusammenbruch (in German). Salzburg: Verlag Das Bergland-Buch. Split in two the Imperial army collapsed, starting a chaotic retiring, since October 28. ^ Low, Alfred D. (1974). The Anschluss Movement, 1918–1919, and the Paris Peace Conference. Philadelphia: American Philosophical Society. p. 296. ISBN 0-87169-103-5. ^ Di Michele, Andrea. Trento, Bolzano e Innsbruck: L’Occupazione Militare Italiana del Tirolo (1918-1920) (PDF) (in Italian). pp. 436–37. ^ Robbins, Keith (2002). The First World War. Oxford University Press. p. 79. ISBN 0-19-280318-2. Gooch, John. "The Italian Army and the First World War". Cambridge University Press. 30 June 2014. Wilks, John; Wilks, Eileen (1998). The British Army in Italy 1917-1918. Pen and Sword. ISBN 9780850526080. Wikimedia Commons has media related to Battle of Vittorio Veneto.